A while ago (at this point, a long while ago) I asked a question on the Art & Design forums on VWVortex.com (seems like an odd place to get advice but there are some very talented individuals). I was stumbling through Photoshop and wanted to know what I should learn next. With all the tutorial sites out there these days, the problem isn’t finding something to learn, it’s figuring out which skill to concentrate on. So I asked the question, if someone was learning Photoshop and wanted to get the most out of their learning time, what should they learn? I left the poll open (hence the lens flare joke) and got a few interesting answers I wanted to share. 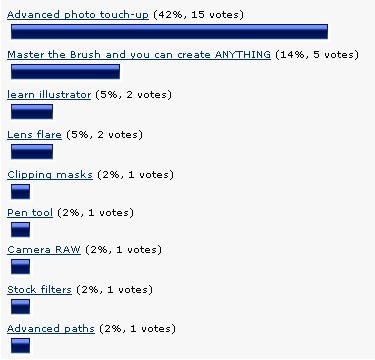 I assumed that people would recommend learning the Pen tool and/or advanced path methods but, sure enough, the winner by far was “learn more about what the software is intended for.” Surprise surprise.